The electric launch "Enid May" will run trips in the Tonbridge area and is the ideal platform for photographing the area and the wildlife. The boat will seat up to 12 passengers comfortably and is safe for kids. Why not enjoy a relaxing 50 minute river trip or book for a private "voyage" either way you get close to nature and can glean some of the areas history from the skipper before finally returning to your starting point by the castle. The rowing boats are large enough for 4 to 5 adults, stable and easy to row, we advise you go anti clockwise around the island, most people can do it in about an hour. Join us for a 2 hour trip with a local wildlife expert who will help to spot, identify and provide facts about animals, birds, insects etc. as we cruise up the river. As the sun sets and dusk descends we are expecting to find and see bats. Cost is £20 (inc a hot drink) per head. Join us for 2 hour trip early in the morning with a local wildlife expert who will help to spot, identify and provide facts about animals, birds, insects etc. as we cruise along the river listening to the Dawn Chorus. Cost is £20 (inc a hot drink) per head. Join us for at least a 2 hour trip down river with a local wildlife expert who will help to spot, identify and provide facts about animals, birds, insects etc. as we cruise down the river. Cost is £20 (inc a hot drink) per head. Include in the email, the trip and date, your name and contact number and how many you are booking for. To order a gift card for an event or to get on the mailing list use the above email address. Gift Cards are available as the ideal Christmas, Birthday, Thank you, Anniversary, etc. etc. present. Email to discuss your gift requirements and we'll provide the card. 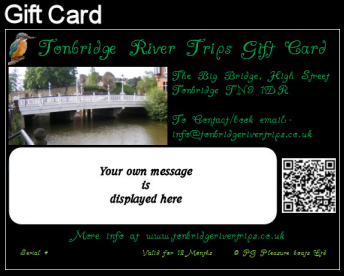 Please email info@tonbridgerivertrips.co.uk with at least your name and contact number, we'll do the rest. Scheduled trips run from 1100 then hourly till early evening. Exclusive trips can be booked for any start time and duration. Final decision on boat hire rests with the skipper. The choice is yours, a one way trip or a round trip from either the Big Bridge or Haysden Park, with or without a stop over. As our trips are scheduled to run on the hour from the Big Bridge, they will stop at Haysden at either 25 or 35 minutes past the hour if requested. To request a stop at Haysden please email (below) at least a day in advance or call the skipper on the number at the top of this page.